Could Massive Open Online Courses be an Alternative to College Degrees? 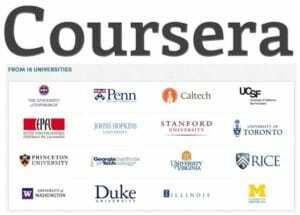 Coursera offers FREE University courses online. Technology in education is not a new concept. Educational CD rooms have existed for over 20 years. Touch screen monitors, internet labs and online grading systems are pretty much the norm these days in schools and colleges. We also see most universities offering hybrid programs that include all or partial courses online, entire departments dedicated to 100% online degrees and continuing education courses, as well as live classes converted into online courses which are then uploaded into e-learning platforms like Coursera. According to the Ambient Insight 2013-2018 Worldwide eLearning Report, the annual growth of the worldwide e-learning market is 4.4% and is set to be worth $53 billion by 2018. A big component of this growth is due to the emergence of online learning that’s outside of a college or university, commonly known as massive open online courses – known as MOOCs. With most businesses and advertising dollars going online, new professions have been born that doesn’t need a full college degree. Internet positions like Online Advertising Managers, Web Developers and Social Media Managers require specific skills that students can acquire as they see fit. With salaries being parallel to skills, millenial need to keep re-educating and re-branding ourselves. It’s safe to ponder – is a college degree what my kid really needs? This is the reason why companies like Apple and NBC include as an employee perk a paid membership to LinkedIN’s Lynda, which offers over 5,500 video courses in industries like 3D Animation, Design, Business & Web Development. 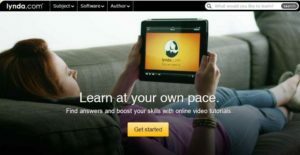 Lynda.com is a LinkedIN company that offers a monthly membership to learn thousands of video courses. It’s a very straight forward offering: you decide what you need to learn, go online to see the courses available, purchase it for a low price, then start learning right away – and at your own time. Due to the flexibility an online scenario offers, you can learn from industry experts from around the world that are not necessarily full-time professors and they currently apply the skills that they teach. With the cost of higher education only getting higher, it can MAY be a very cost-effective alternative to getting into college debt. MOOCs usually make money in one – or a combination of two ways: you paying for the individual course or paying a low monthly membership fee that allows you to take as many courses as you want. Once professors create the course, MOOCs enjoy of passive income through on-demand courses that can be sold over and over with minimal head count. MCOO’s on-demand format doesn’t include the level of structure and commitment that traditional institutions offer, as students see it as “always being there.’ For students that prefer questions answered on the spot, prefer speaking vs writing and often need concepts re-phrased and repeated in order to grasp concept, the online environment can be challenging. With the clear cons and pros of online learning, we will probably see more MOOCs options like Platzi, a blended e-learning platform that combines live video-conferences with professors and on-demand video. Just like any other technology, there’s a learning curve to becoming familiar with the e-learning platform before actually starting to learn. So definitely, this option is only good for those who feel comfortable using the Internet and learning in it. Forbes predicts that in the future, companies will place more weight in non-college education, as they will be looking at these as predictors of skills and ability to learn. Currently, they still put a lot of weight on the pedigree of degrees, mabye we can’t think of MOOCs as a replacement – but more of a compliment. This entry was posted in College Prep, Parenting Teens, Teaching & Education Tips and tagged College, college prep, e-learning, Massive Online Open Courses, MOOC, online education, online learning. Bookmark the permalink.